Russian troops marched across Red Square in a huge military parade on Sunday, May 9, 2015 to commemorate the 70th anniversary of victory over Nazi Germany. Western leaders including those from U.S. and U.K. boycotted the parade over the Ukraine crisis. Nonetheless, President Vladimir Putin was joined by 30 foreign leaders, including Chinese President Xi Jinping and United Nations Secretary General Ban Ki-moon. During the 60th anniversary in 2005, 53 heads of state, including President George W. Bush, attended the Victory Day ceremony at Red Square. 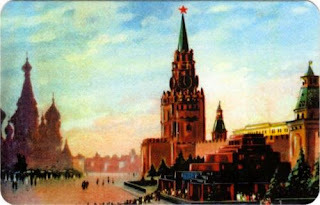 Postcard RU-3105343 from Russia was a vintage postcard showing Red Square in Moscow with Saint Basil's Cathedral on the left and Kremlin Palace on the right.